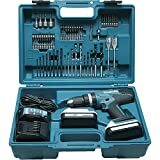 The Makita drill set HP457DWE10 is perfect for the DIY enthusiast who wants to get a complete package of combi drill, charger, battery and accessory kit! Makita drill sets are very popular among professionals and DIY enthusiasts alike. This is simply because they allow you to get extra tools, batteries, chargers, and even accessory sets together with your drill. The HP457DWE Makita drill comes with a set of exciting features that truly set it apart. We have listed a few of them for you. When you unpack this Makita drill set, the first thing you will notice is the ergonomic grip of the combi-drill. This is the signature Makita design choice. It ensures you are comfortable while using it. This reduces the possibility of you getting tired before you are done with your work. Another signature Makita design choice is the conveniently placed forward/ reverse switch. This switch makes the transition between the two directions easier. Being a combi-tool, it comes as no surprise that the HP457DWE drill incorporates three modes. These are the drilling mode, impact driver mode and hammer mode. This quality makes this tool extremely versatile. Another redeeming quality of this combi-drill is its variable speed control trigger which makes it easy for you to vary the speed of the machine as you please. Additionally, the keyless chuck of this Makita combi-drill makes it easy to install bits. As if that isn’t enough, you also get to choose from among 16 torque settings. It’s also worth noting that the Makita HP457DWE is in the G-series range of cordless power tools and not the more popular LXT series. This Makita drill set, therefore, comes with two 1.3 Ah Li-Ion G-series batteries. You should however never substitute these batteries with LXT ones. The featured combi-drill is not compatible with them or any other LXT accessory. Finally, Makita drill set also comes with a charger and an accessory set with 74 pieces. All these items come in a compact Makita carrying case for the purpose of easy storage and transportation. Although the Makita drill set works pretty well, it also faces some serious challenges. First of all, the combi-drill is not as powerful as the LXT range of drills. This is due to extra features that are present in an LXT drill. Also, the charger that comes with this Makita drill set simply can’t compare to that of the LXT series. Finally, LXT batteries have longer run times, charge faster and heat up less than the G-series batteries. Whereas the LXT batteries can take as little as 22 minutes to charge, the featured G-series batteries take one hour. Generally, this Makita drill set works pretty well. It’s even quite affordable. However, it doesn’t hold a torch to the popular LXT brand of products. It can make a good starting device for you but is far from being the best Makita combi-drill. For better results with repetitive heavy duty work, you should probably take a look a the LXT version below which features a combi drill and impact driver as part of the set. In conclusion, this Makita drill set works well and is quite durable. It can serve you for a very long time. However, it isn’t the most powerful of tools and usually acts as a stepping stone to more powerful drill sets. The Makita HP457DWE Drill Set is a good performer that’s easy to use. While not the most powerful drill at this price point, it does get the job done and is a great introduction to the Makita tools ecosystem.